Principal Cast : William Moseley, Anna Popplewell, Skandar Keynes, Georgie Henley, Liam Neeson, Tilda Swinton, James McAvoy, Ray Winstone, Dawn French, Kiran Shah, Jim Broadbent, Elizabeth Hawthorne, James Cosmo, Michael Madsen, Patrick Kake, Shane Rangi, Rupert Everett. With the literary success of both Tolkien’s Lord of The Rings and JK Rowling’s Harry Potter both making juggernaut cinematic franchises at the dawn of the new millennium, Hollywood studios quickly cast their eyes towards other classic works of fiction to see which, if any, might make blockbuster coin at the box-office. Disney ventured into the territory of CS Lewis’ classic children’s series involving the mysterious land of Narnia, based on the writer’s books and the fact that he was a contemporary of JRR Tolkien himself. The first instalment of the big-budget Narnia franchise, the clumsily titled The Lion The Witch & The Wardrobe, lifts much of Lewis’ original text line for line, expands the relative sparse material and ratchets up the intended awe by lavishing incredible effects and really expensive production design at the classic story. What’s troubling to me is that a film with so much attention put into it can feel so hollow and empty. The four young Pevensie children are sent to stay in the country whilst London is being bombed during the Blitz, during World War II. Whilst at the estate of Professor Kirke (Jim Broadbent), the found youngsters accidentally stumble into a mysterious wardrobe, a wardrobe which functions as a portal to the astonishing world of Narnia. 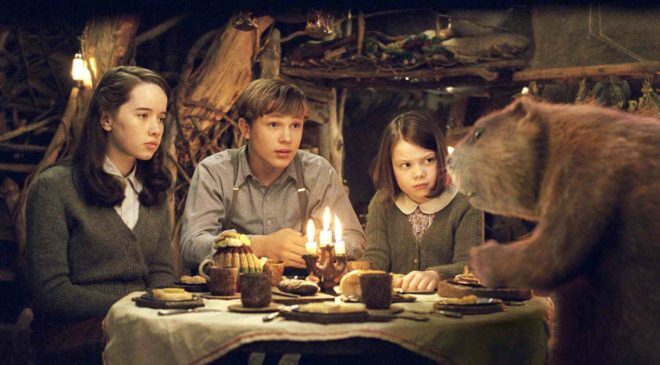 Peter (William Moseley), Susan (Anna Popplewell), the malcontent Edmund (Skylar Keynes) and the sweet and innocent youngest, Lucy (George Henley) meet all manner of creatures in Narnia, including a fawn, Mr Tumnus (James McAvoy), Father Christmas (James Cosmo), a pair of friendly beavers (Ray Winstone and Dawn French), as well as the great lion who created the world, Aslan (Liam Neeson) and The White Witch (Tilda Swinton), who wishes to enslave it by turning its inhabitants to stone. 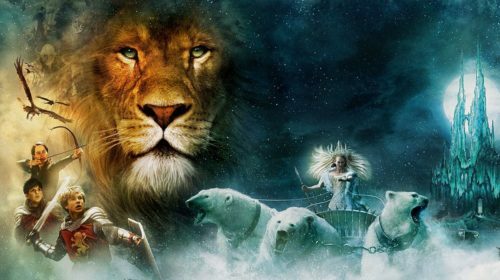 The four children discover that they are the rightful heirs to the four thrones of Narnia, and so gather an army to battle the forces of the White Witch to save the land. You have to wonder how many people would be aware that CS Lewis was a converted christian, and as such devoted a lot of time in his writings to developing themes of faith and iconography that allegories biblical teachings? Probably not as many as one suspects. 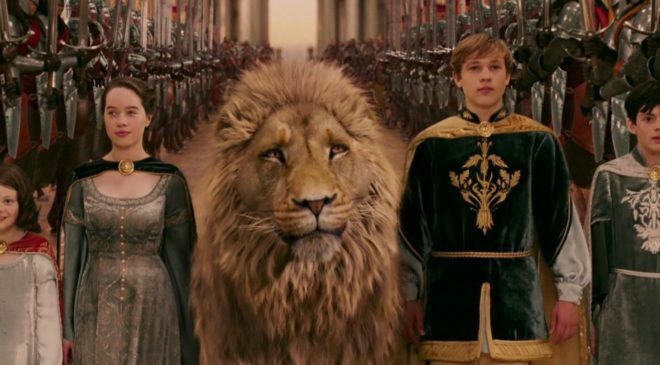 The Narnia books, originally published in the 1950’s, have previously been adapted on both television, radio and stage, with Disney staking their claim as the first to transport audiences to the fantasy world on the big screen, kicking off with the first published novel, The Lion The Witch & The Wardrobe as their opening salvo. Although the other six books arguably wrap around Wardrobe in terms of chronology, Disney’s decision to commence with the most famous of all Lewis’ Narnia texts proved salient indeed. The film raked in a whopping three quarters of a billion dollars, garnered positive critical acclaim and swept to Oscar glory snagging the Best Makeup category for the 2005 calendar year. With all this positivity going for it, how do I struggle to find much good to say about it? The film flounders with its central themes. The story opens with a fractured family, weaves in a sense of isolation, finding one’s path and angry betrayal, before climaxing with a muddled, widescreen fantasy battle in the New Zealand landscapes upon which original Shrek director Andrew Adamson placed his cameras. Adamson’s first live-action film, The Lion The Witch & The Wardrobe is opulent, big-budget and utterly confused as to whatever point it’s trying to make. The paucity of literary depth to Lewis’ original book, which is really quite thin on the ground in terms of defining characters beyond Edmund, Peter and Lucy, forced the screenwriters – Ann Peacock, Adamson, and eventual Avengers Infinity War scribes Christopher Markus and Stephen McFeely – to flesh out these well-known roles with a little more depth than their genesis previously gave us. Problematically, it fails to develop any real thematic weight despite the best intent of all involved, thwarting the film’s aggressively action-oriented style to really matter where it counts. 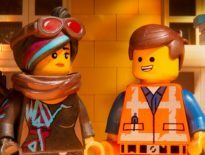 Oh, it’s earnest enough, sure, but there’s a stiffness, a distance between script and screen that undercuts the simplistic story beats and makes them harder to invest in that they should be. 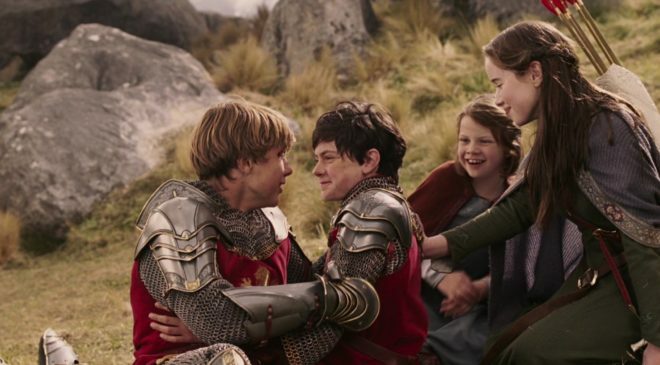 The film hangs on the quality of its central performances, notably the four young actors chosen for the key roles of Peter, Susan, Edmund and Lucy. The kids do a good job, but their lack of chemistry together or on the screen in these difficultly indifferent roles shows throughout the film. Georgie Henley is easily the most watchable, all cute and innocent as Lucy, but a surprise package in Skander Keynes as Edmund, who takes on the thoroughly unlikeable lad and runs with it, is also a solid job. William Moseley has the good looks but cannot muster the grace or gravitas he needs as Peter – Peter always struck me as a vaguely Aragorn-esque leader role, and the film’s climactic battle between all manner of fantasy beasts invites him to rise up to the challenge as a leader, but Moseley struggles with the occasion, sadly – and Anna Popplewell, while gorgeous as Susan, feels like a fifth wheel. Her character arc is the least interesting in the entire film, and she spends more time as a chaperone or motherly figure haranguing her siblings than she does investing in herself. 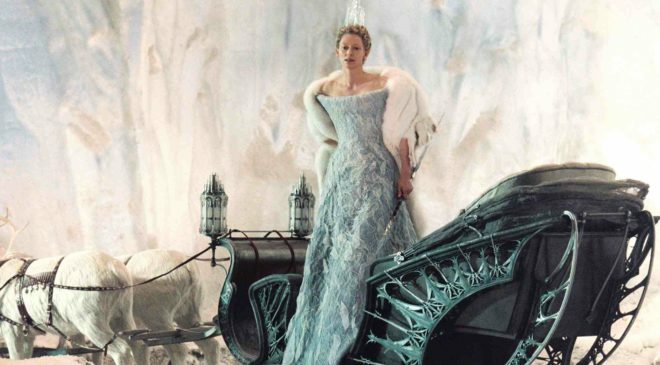 Kids aside, Tilda Swinton is in a class of her own as The White Witch, Jadis, and at times also appears to be acting in a completely different film altogether. Swinton’s ubiquitous kookiness has found her in hot demand throughout Hollywood, but for me she’s miscast here. Her harsh features and the film’s extraordinary costuming do her a disservice, and I didn’t really ever buy her as a genuine villain despite the creatures she turned to stone throughout. There’s something off about her here, something I didn’t buy into, and as classy an actress as she is (really, her best villain role to-date remains in Snowpiercer) I think a different name should have been cast. James McAvoy turns in a sweet shot at cloven-hoofed Mr Tumnus, Lord Of The Rings trilogy scale double Kiran Shah has a significant on-screen role as Jadis’ dwarf servant, Ginarrbrik, and James Cosmo makes a nice Santa cameo work. Voice work by Ray Winstone, Dawn French, Michael Madsen and Rupert Everett, as various all-digital animalia of Narnia, provide moments of fear and humour alternatively, and Jim Broadbent once more old-man’s himself through a paycheck role as the venerable Professor who may know more about Narnia than he lets on. Of course, everyone’s favourite allegorical God figurehead, the giant lion Aslan, is voiced by Liam Neeson and to a fault the digital animation is nothing short of mediocre. Especially in 2019, over a decade since the film released and visual effects have become more wizard-like. 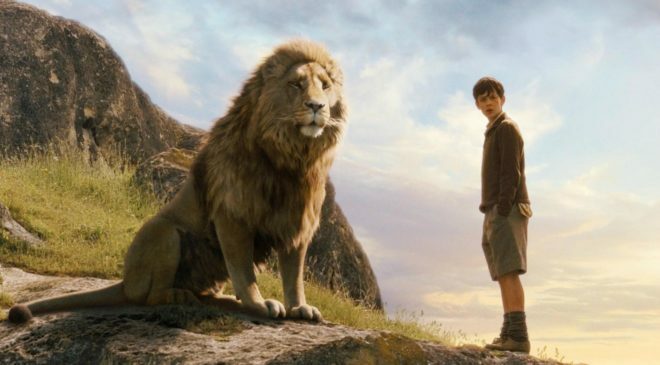 Still, the effect of Aslan’s appearance on screen is great, a literary icon wrought by pixels and processors as only 2005 computer power can achieve. Neeson is one of only a few obvious choices for the role – James Earl Jones had his shot with Aslan-esque Mufasa back in 1994 – and he nails the emotional connection of the role. The Lion, The Witch & The Wardrobe came out when the Lord Of The Rings had concluded and the Harry Potter films were gathering steam, and in truth it can’t match either property for conviction of concept, or execution of storytelling. Andrew Adamson’s direction is stately without bringing the awe, enthusiastic without a sense of fun, and prolonged for no reason other than to stretch out an altogether paper-thin story to a full two-hours. Honestly, I could just read the book faster than watch this film. 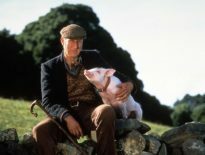 It’s not that the film is bad or the filmmakers missed their marks, because for all intents and purposes they achieved exactly what CS Lewis wrote on the page a half-century earlier. The film just feels empty, devoid of the passion the entire thing is predicated upon. A fascinating visual effects extravaganza that ultimately meanders along with characters we struggle to invest in, on an adventure that feels all too familiar yet staggeringly indifferent, The Lion, The Witch & The Wardrobe is expensively clumsy fantasy film-making that perforates the written word and succumbs to the weight of its own expectation. Non-discerning children will probably get a kick out of it, but adults will soon find themselves checking their watches.